Yes, he is mine and yes, that means it is my job to think he is the cutest thing ever. But come on, who can argue with this picture as proof? 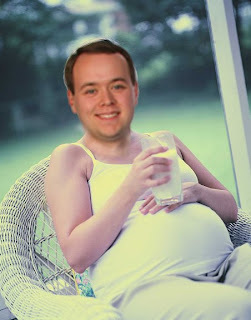 Ever wonder what my husband would look like pregnant and drinking a large glass of milk? Me neither, but we get to see anyway! The House of Snot and Phlegm. It is official. All three of us have a cold. J went down first, catching it from Gammie while we were at the hockey game Saturday. Then, of course, I immediately caught it from him (I have a hard time avoiding all the drool bombs he drops on me). G looked like he might fight it, but woke this morning with quite the manly voice (i.e. all deep and phlegmy). So, come to our house at your own risk. Well, my baby vacation is officially over. 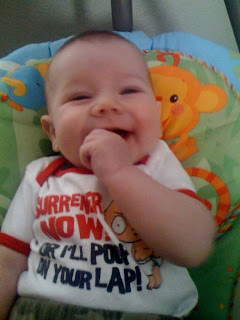 When I had J, I took the usual 12 weeks of maternity leave (I can’t believe it has already been 12 weeks!) and G only stayed home for the first week or so. His time was so short because now he is taking over baby duty! Today marks the first of 8 weeks that he will be staying at home with J. Cool, right? I think it will be great for them to get some good time in together (with G working full time and in school full time, they didn’t get a lot of time together before now). And judging by this picture I took of them together over the weekend, they are going to have a lot of fun without me! Yesterday I took J in to participate in a study. It is one that is studying how/if the hearing of normal hearing children changes over time (L, let me know if I completely wrong with this). Mainly, it was just an excuse to drive up to see my sis (and to do it 5 more times over the next 5 months)! When I told J he was going to be a subject in a study he was a little worried. The dogs heard about all of this and had some worries of their own. But, I reassured everyone that Auntie L would not lead us astray. And I was right, look how relaxed J was! He was a very good boy throughout the whole process! K did such a great job with her shopping booty, I didn’t want to be left out! Clockwise from the left: Cotton Fleece in Sedona Red (the project on top is the start of the Cropped Cardigan with leaf ties from Fitted Knits), Knit One Crochets Too’s Ty-Dy in Pumkin Garden (destined to be some kind of cute piece of baby clothing for J inspired by the sweater that K made him out of Ty-Dy), Debbie Bliss Baby Cashmerino in fuchsia (previously featured here as the start of the ill-fated lace scarf), Cascade Yarns Pima Tencel in color 1694 (no idea what this will be for, some kind of tank maybe? ), Knit Picks Shine Sport in Orchid (see here for plans for this yarn), and the two balls are some cotton mill ends that I picked up (no idea what these will be either…). The Cotton Fleece, Ty-Dy and mill ends were purchased at Soft Horizons Fibre in Eugene. I bought the Cashmerino and Pima Tencel at Boersma’s Knitting Basket in McMinnville. Other recent purchases not pictured include a set of Knit Picks Options Harmony Wood Needles (I am totally in love!) and the Crochet Me pattern book. I love yarn shopping, but now comes the hard part of figuring out where to put all of this new stuff!